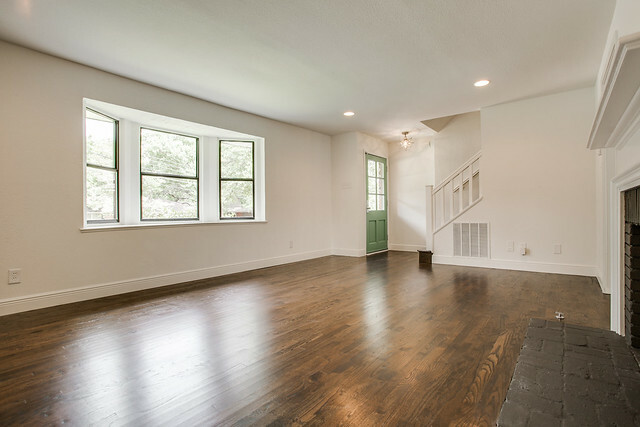 Now that you’ve seen the “after” photos of the outside of our 8th flip, would you care to take a peek inside? This house is the first two-story that we’ve done – it presented some challenges along the way but I think it’s neat how the downstairs is completely dedicated to living and the upstairs to sleeping. As a mom to two little ones, it sounds like such a luxury to be noisy and go about your business downstairs while the babes are sleeping away peacefully (hopefully) upstairs! 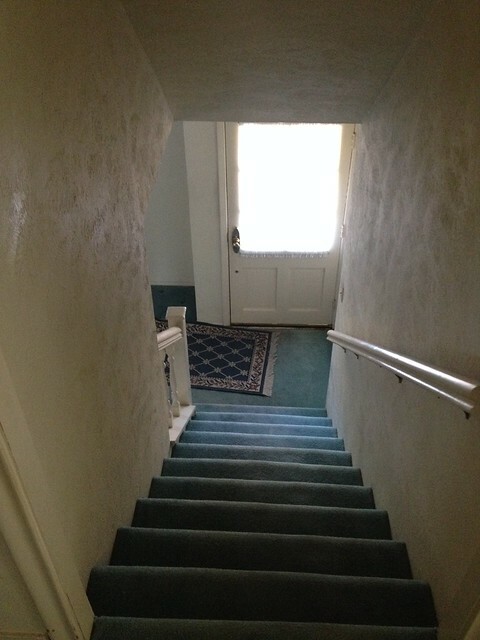 However, those stairs weren’t too cute when we started out – too much blue carpet throughout the entire house. 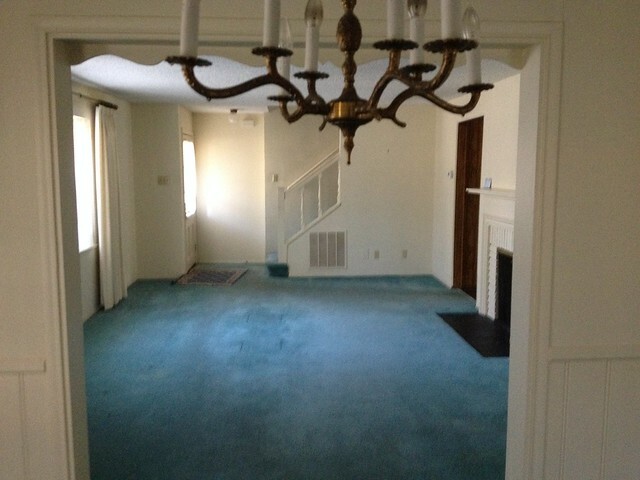 The blue theme continued into the formal living room, which is just to the left of those stairs above. And while the built-ins added some storage and an opportunity for display, the scallops and barn door cabinets weren’t too cute. 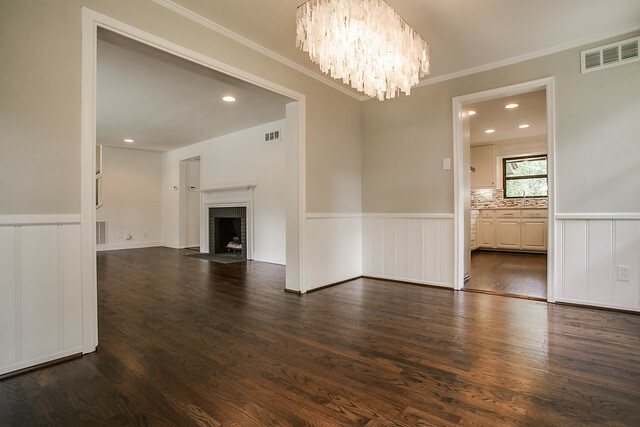 We added hardwoods here, cleaned up the fireplace, and added some new trim detail to the built-ins as well as Shaker-style cabinet doors. Things were looking pretty scary before they got better. And since we have a second story above the living room, the sheetrock looked like Swiss cheese after the electricians finished the wiring for the recessed lighting. You can also see in the photo below that we removed the spindles from the bannister (and replaced them) because they were spaced too far apart – my two-year old definitely would have stuck her head between them, ha! The bay window was a really nice feature of the room but it was lost behind those layers of curtains! 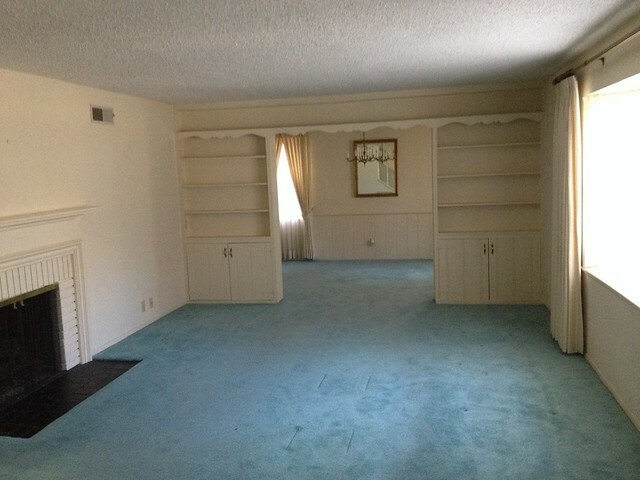 Here’s the view of the living room looking back towards the front door. The photo below was taken from the dining room – do you feel like you’re on a cruise, surrounded by the blue sea? 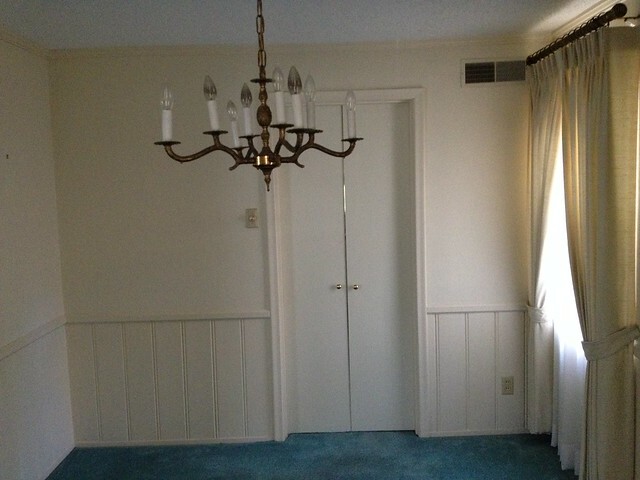 And here’s the actual dining room, located just off the living room. … but we removed them to create a more open feel. Next up is the kitchen, family room, and the other spaces on the first floor! I originally intended the first floor to just be one post but it got a little long. Stay tuned! P.S. 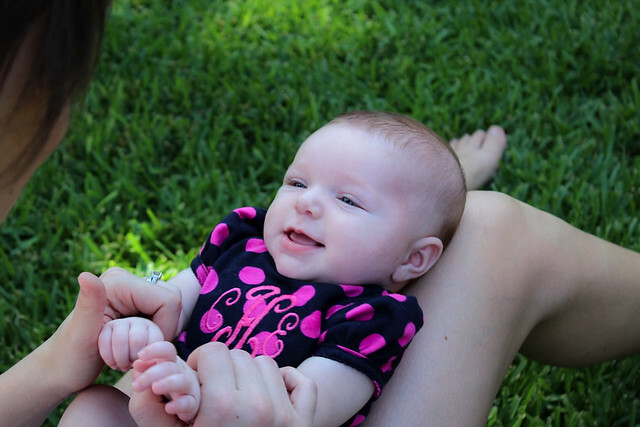 My sweet baby is 3 months old today!! Sniffle. 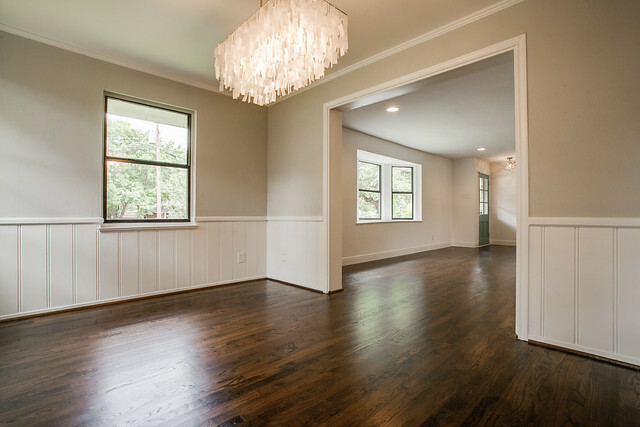 What kind of hardwoods did you install? 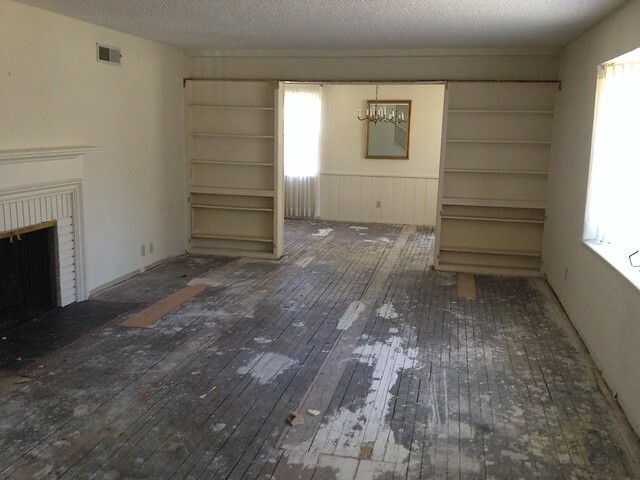 We are just about to redo our floors and I love the look and color if the ones in this house. Congrats, it looks beautiful! Thanks, Cara! They are 2-1/4″ red oak hardwoods – I’m not 100% positive which stained we used this time, but we usually use Minwax DuraSeal in Antique Brown, so that’s a good place to start. Your floors are beautiful! 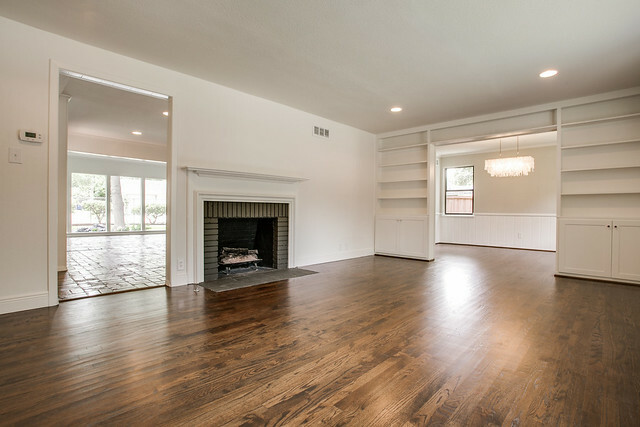 Did you use the existing floor and repair and refinish, or are those completely new floors? Thanks, Peggy! We were able to salvage the wood floors upstairs (you’ll see them in an upcoming post), but our floor guy said the gaps between the existing floors on the first floor were too large to fill and would look terrible – so, they’re completely new floors on the first level. 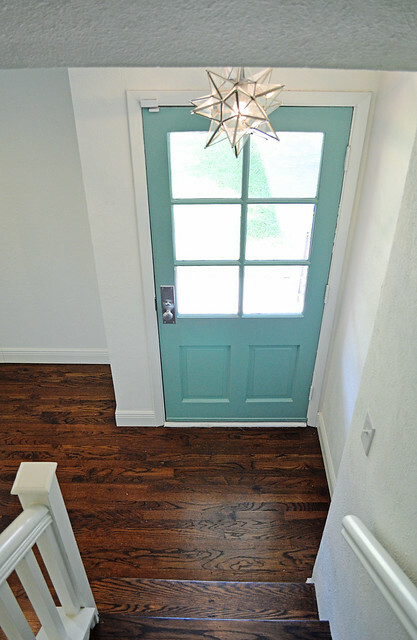 What paint color did you use on the front door? I love it! Hi! I didn’t write it down (doh!) and I’m trying to figure it out – I’ll keep you posted!!! What a difference pain and floors make!!! Looks fantastic. 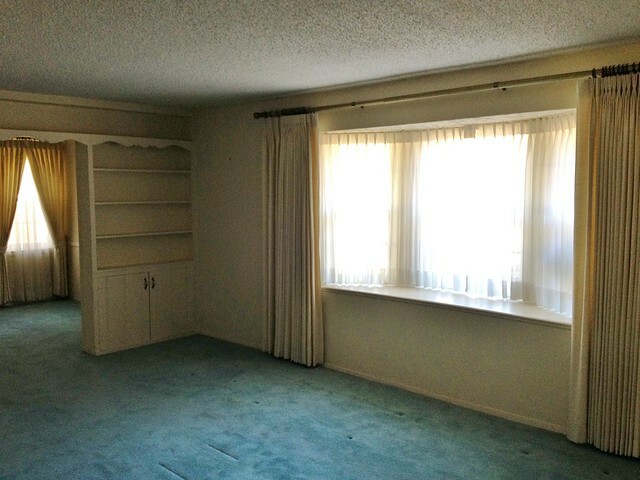 And it looks like you scraped the popcorn ceilings…great job…I hate those! Amazing Transformation! This house rocks compared to the before and after pictures you took. 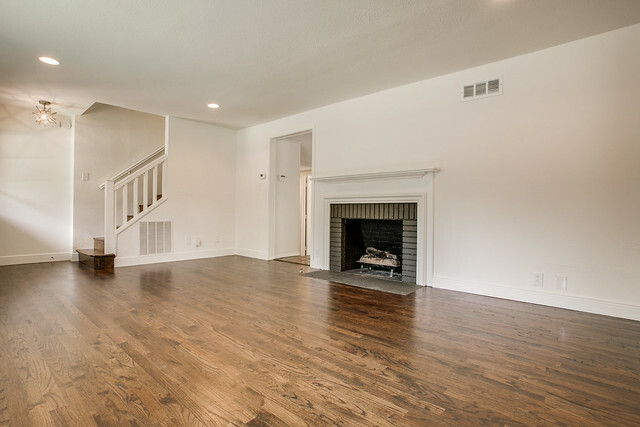 I love the wood flooring and how you continued it throughout the entire bottom floor and up the stairs. That entryway made my mind jump Young House Love haha. Anyone else? The house looks awesome, as usual! I love the color of your front door! 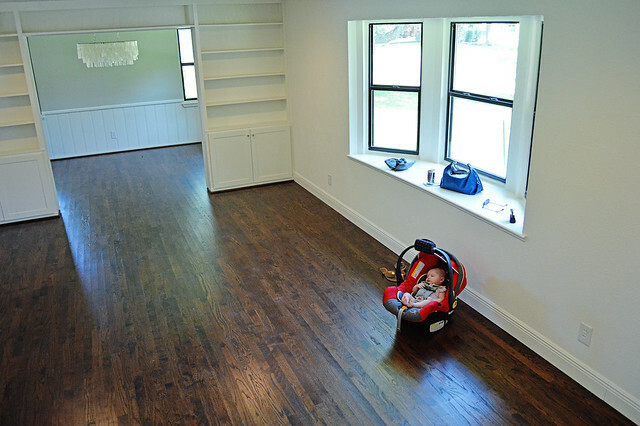 Another fan of the floors here – they look great! And your daughter is just adorable!! Hi – love all that you’re doing! Buying homes from the 60s and 70s, how do you deal with potential problems such as lead paint or asbestos. Is that something that comes out in the home inspection and is addressed then? How do you address these type of problems that often come with older homes? I’m sure many of us are wondering about that? Hi Darlene! Luckily, we have never run into a problem with either of those 2 issues (and I haven’t really heard of anyone having a problem with them in our area). When a home built before 1978 is sold in Texas, there’s a form that the homeowner must fill out stating whether they have any knowledge of lead-based paint, and it can also be tested for during the home inspection. 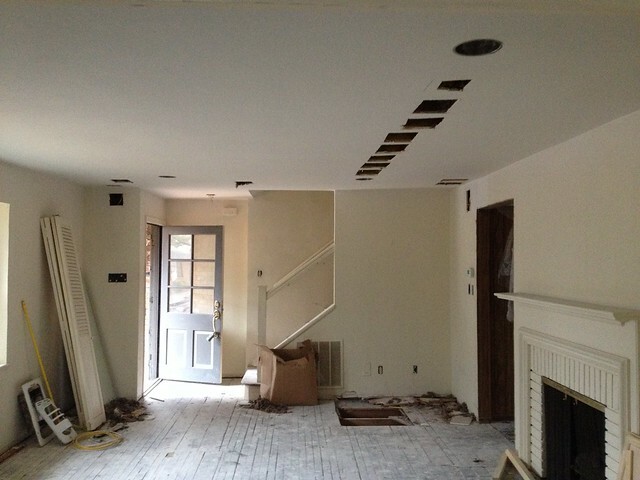 I haven’t heard of asbestos being tested for during an inspection – it usually seems to be discovered while a home is being renovated.